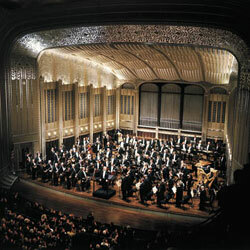 Cleveland Orchestra's residency in Florida very controversial. Now closing the fifth season of its annual residency in Miami, the Cleveland Orchestra has brought Beethoven’s Fifth Symphony to public school children, master teachers to the University of Miami and top-flight performances of classics to the Adrienne Arsht Center.Yet the residency has also vacuumed up scarce philanthropic dollars at a time when South Florida arts organizations are cutting back while giving Miami audiences a parade of lowest-common-denominator works like Bolero and Pictures at an Exhibition.For three weeks each winter, the orchestra escapes the blustery shore of Lake Erie for the palm trees, sand and sun of South Florida, playing a three-program concert series at the Arsht Center, putting on children’s concerts – some offered free for Miami public school students — and engaging in an intense round of master classes, side-by-side performances, recitals and other events at the University of Miami and other institutions.The residency, which holds its final concerts of the year this weekend at the Arsht Center, is one of several the orchestra has developed to expand its audience and donor base beyond its Ohio home in a city that has lost 17 percent of its population over the past decade, according to Census data released last month. The other residency cities are New York, Vienna, Lucerne and Bloomington, Indiana.Opinions vary widely on the impact of the Miami residency.“I think it’s been great for Miami,” said Hector Fortun, a Miami insurance executive who serves on the board of the Musical Arts Association of Miami, the fundraising arm of the Miami residency. “You have one of the world’s best orchestras performing in Miami, with high-caliber music, visits to local schools, making a fabulous contribution. It’s another happening like the Super Bowl and the boat show.“People fly in from Puerto Rico, Venezuela. How lucky we are to have an orchestra of that caliber in Miami. Otherwise you’d have to go to Vienna to hear an orchestra that good.”But even with the orchestra’s busy community activities, many local musicians still see the three-week residency as a drag on South Florida’s arts scene—-weakening the incentive for establishing a local orchestra to replace the defunct Florida Philharmonic Orchestra and crowding out the fundraising efforts of local arts organizations.“The consensus from the musical community is that a three-week residency in no way can replace a local orchestra,” said Jeffrey Apana, an oboist and secretary-treasurer of the South Florida Musicians Association. “The Cleveland Orchestra comes for three weeks a season, and the money they’re making has been taken back to Cleveland and not spent in the local community. An orchestra in residency is not a substitute for a local orchestra. A local orchestra is part of the community and gives back to the community.”A local orchestra, Apana adds, would provide a pool of high-quality professionals to serve as music teachers, chamber music players and performers in opera and ballet orchestras. It would also provide opportunities for freelancers to work as replacements. And any money that it raises, it spends in the community.In the first three years of the Miami residency, the orchestra raised a total of $8,107,256 in South Florida, counting multi-year pledges, according to publicly available tax forms. Fundraising from last year and the current season has not yet been reported. The money goes toward paying part of the orchestra’s annual budget, which includes — at the high end — music director Franz Welser-Möst’s salary of $1,124,033 and concertmaster William Preucil’s salary of $467,212, according to 2008 tax forms. Welser-Möst volunteered to take a pay cut in 2009, during financial difficulties for the orchestra. A spokeswoman declined to provide updated figures, saying salaries were a confidential personnel matter. READS MORE via South Florida Classical Review » Blog Archive » After five years, the Cleveland Orchestra’s Miami residency remains both prized and controversial. This entry was posted on Tuesday, April 19th, 2011 at 10:10 am	and is filed under Fiddle news and fun. You can follow any responses to this entry through the RSS 2.0 feed. Responses are currently closed, but you can trackback from your own site.